I hope we find some great talent at these camps for another outstanding recruiting class. We can thank Ed Orgeron for his participation in our camp. They'll be kids coming in far and wide that otherwise would not have. I hope LSU football prospers under their current staff who sees value in directing talent (particularly in-state), towards us rather than their SEC and Big 12 rivals. Let us hope that we once again become the default second school in recruiting Louisiana talent. wave97 wrote: We can thank Ed Orgeron for his participation in our camp. They'll be kids coming in far and wide that otherwise would not have. I hope LSU football prospers under their current staff who sees value in directing talent (particularly in-state), towards us rather than their SEC and Big 12 rivals. Personally, I'm not a fan of the shared camps with LSU, but, if Tulane signs another solid recruiting class in 2018, I will be a believer as that would be a game changer. On way off topic subjects, ESPN predicts LSU will win 6 games in the 2018 regular season, and, if Tulane could win at least 1 more game than LSU in the same season, that could be another game changer. I agree. Playing well against and defeating the p5 teams on our future ooc schedule will go far in waking up the locals to the transformation happening uptown. Hadn’t heard anything Tulane but LSU lands a great kicker at the camp. York of Proper (Texas) High, rated the nation's No. 2 placekicker and No. 2 punter by Kohl's, one of the nation's top kicking camps, committed to LSU Sunday afternoon. He was offered by LSU coach Ed Orgeron at a joint LSU/Tulane prospect camp staged at the New Orleans Saints practice facility. Ryan Wright was rated #4 by Kohl's for punting. Can't find anything about him being a placekicker. I think in order to really gain traction, Tulane would need to beat Wake and at least put some pressure on OSU first half. Would make for some fun internet banter! We've signed several kickers with high ratings from Kohl's recently and they haven't panned out. No doubt. We need to be 3-0 and play well for 4 quarters up there to start getting our fans to pay attention again. Yeah I still feel like LSU benefits more from Tulane not holding camps with out of state P5s than Tulane does. If the goal is to weaken LAU’s stranglehold on Louisiana recruits, Tulane should be bringing in Texas or TCU and the like. Here’s an update on all camp commitments. If the goal is to weaken LAU’s stranglehold on Louisiana recruits, Tulane should be bringing in Texas or TCU and the like. Is that the the goal, though? If it is, it is a short-sighted one. There is plenty of talent in Louisiana. We can make a lot of hay with the "scaps." If you encourage other P5's to come in and take the cream of Louisiana talent than you force LSU to take kids that otherwise may have fallen to us. If out-of-state schools drink LSU's milkshake than LSU is going to turn around and take ours. You may now commence with the indignant pearl-clutching. I hear what you are saying ajcalhoun, and I do agree. But we all know a good 90% of the kids at this camp are here for LSU. 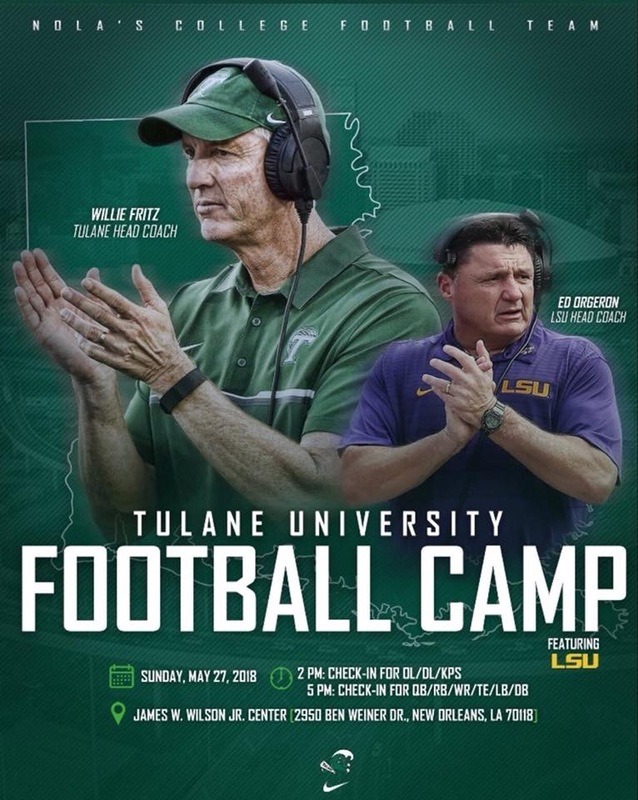 I'm asking... does LSU host a camp in BR and invite Tulane? But we all know a good 90% of the kids at this camp are here for LSU. I don't know how accurate that figure is but if it is then that means we got nine times as many potential recruits on our campus for a visit. That is a good thing. It is then up to our staff to sell them on staying here. It's a whole lot easier to sell to someone when they're in the door already. That is a good question that I don't have the answer to. The 90% was made up. I should have said majority. My point is still the same. It got kids on campus that otherwise may not have given us the time of day. You're not alone in feeling that way. I'd bet a majority of the regular members of this board feel the same way. Probably even more than that. My irrational Tulane fan brain TOTALLY agrees with NOLABigSteve! My rational Tulane fan brain says anything we need to do to improve recruiting we should do. We need to play LSU on Thanksgiving EVERY YEAR IN PERPETUITY. Too bad Paul Tulane didn't put that in his gift to the State of Louisiana.